Al Maha Rotana Suites located at a convenient distance from business and banking districts and shopping malls in the busy city center. Abu Dhabi International Exhibitions Centre, Abu Dhabi International Airport and Dubai International Airport are at approachable distance from the hotel. Enjoy your stay in the laps of luxury with friendly service, tempting food and latest facilities. 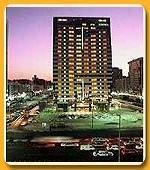 Al Maha Rotana Suites presents 228 studios and suites on 22 floors. Stay in the tastefully done rooms where attention till minutest detail is given to make your experience of the hotel memorable. Each studio and suite features a well-stocked kitchenette, mini- fridge, tea/coffee machine, in-room safe and underground parking. Other facilities provided in the rooms are satellite television, international direct dial telephone with voice mail, high-speed Internet connectivity, bathing amenities, hair dryer and washer and dryer. City Café is the restaurant at Al Maha Rotana Suites. Here you will find food round the clock to suit every palate. From continental to traditional, you name any platter and it is served for you in a jiffy with the authentic flavor and aroma for breakfast, lunch and dinner. Besides the proper meals, you can also try a variety of teas, coffees and tempting confectionaries. At Al Maha Rotana Suites, we have a multipurpose banquet hall and 2 boardrooms. They can fulfill your need for the conclaves, presentations and meetings. Video conferencing and other technologically advanced conference aids are also available. Head for our state-of-the-art fitness club, Bodylines. Cool down in the rooftop swimming pool. Work out with cardio-vascular equipments under the watchful eyes of professional instructors. Get a refreshing new look after a soothing massage by an expert masseur, steam bath or Jacuzzi. In your free time, play a game of table tennis, billiards or dart. We make arrangements for golf putting, desert safaris, camel treks, and dune skiing and diving as well. Enjoy at the modern air-conditioned shopping malls. Other facilities at Al Maha Rotana Suites include Car Rental, Laundry and Dry-Cleaning Services, Baby Cots, Baby Sitting and Round the Clock room Service.